Cost to landscape on a new construction varies greatly by region (and even by zip code). Get free estimates from landscapers in your city. Cost to landscape on a new construction varies greatly by region (and even by zip code). The cost of installing landscaping in an average-sized yard is around $13,200​. How much does it cost to landscape on a new construction? Landscaping can be defined as making improvements to your property’s grounds in order to make it more attractive and functional. While you may choose to do the work yourself, most homeowners prefer hiring a landscape architect or designer to beautify their property. Professional landscaping not only transforms your yard into a gorgeous oasis, it also increases your home’s value and enables you to enjoy your grounds to its maximum potential. Also, some specialty tasks such as pruning a prize tree or installing a driveway are better handled by a professional with specialized skills. On an average, landscaping design and construction for an average-sized yard of 1,200 sq.ft, new construction, would cost you around $13,200. Your landscaping cost can vary depending on the size of your yard, what features you are looking for, for example, front walk, fire pit etc., the type of materials and plants needed for the project, location, access to machinery, quality of soil, and need to add or remove soil. The current condition of the yard is another determining factor in calculating landscaping costs. If you are living in a brand new house in a new locality, chances are you will have to start from basics. If you are looking to update your existing landscape, costs will vary depending on whether you have to get rid of plants or demolish a concrete pathway or patio. Concrete removal costs around $400-$600, assuming a 200 sq.ft. area of unreinforced concrete such as a patio. While front yard landscaping focuses on improving the curb appeal of your property, backyard landscaping may include creating a nice seating area for outdoor dining, installing a fire pit, planting a kitchen garden, planting hedges and plants around the boundaries of the property to ensure privacy, choosing plants and trees that can help with the cooling and heating of your home thereby reducing energy costs, and so on. A holistic approach and careful planning and design are key elements of beautiful landscaping, which is why most homeowners choose to work with a landscape designer or a landscape architect who can help them create the landscape of their dreams within their budget. Even homeowners who ultimately choose to do the actual planting themselves need the help of a designer during the planning and design phase to avoid costly and time-consuming mistakes such as planting plants that require a lot of sun in a shady spot and planting a tree very close to the foundation of a building. Depending on your needs, a designer can also help you choose plants that are low maintenance or complement each other and create beautiful designs. During the design phase, the designer will also evaluate the need for grading 1 or resloping the land. This is very important because if the water does not properly drain away from your home’s foundation, it can give rise to water damage and other issues such as mold and mildew in no time. A landscape designer may charge you $2,000-$6,000 for a detailed plan with verbal consultation charged additionally at the rate of $80-$120 per hour. One of the most popular landscaping styles throughout the world, Mediterranean gardens are characterized by tiered fountains, terracotta pots, statuary and plants that provide color, texture and structure. Japanese garden designs are heavily influenced by Buddhist, Taoist and Shinto philosophies and use natural elements like plants, ornaments, rocks and water to create a peaceful and spiritual atmosphere. The Tuscan garden style combines trademark plantings like rosemary, lavender and Italian cypress with terracotta urns, natural stone and bright colors like red, yellow and orange. English cottage gardens are lush and free-flowering and give the impression of an unplanned landscape. White picket fences 2, charming birdhouses, wheelbarrows, arbors 3, and layered arrangements of classic, old-fashioned plants such as peonies, foxgloves, pansies, cosmos, and roses are trademark elements of this design. Formal landscapes are characterized by simple geometric designs, symmetry, straight edges, long sightlines, classic urns, and traditional building materials. The southwest landscape design incorporates Spanish and Native American details and is characterized by native plants and bold and colorful building materials that reflect the natural landscapes of the region. One thing to keep in mind is that all landscape designers do not offer installation services. If that is the case, you may need to hire a landscaping contractor or a groundskeeper to bring the design to life. Hardscaping refers to all the inanimate elements used to make land more attractive and functional, for example, retaining walls 5, patios, gazebos, pathways etc. They can be made of concrete, brick, stone, wood or metal. Hardscaping costs can vary widely, depending on the type of elements you wish to add to your landscape. A pergola can cost between $3,000 and $5,000, depending on the size and materials, while a 50 ft. long retaining wall 5, 8 feet in height can be built for around $13,700. Softscaping is used to describe all the living elements of your landscape that change with time. Bushes, trees, ornamental plants and flower beds are good examples of softscaping. When choosing plants for your landscaping, it is very important to understand the difference between annuals and perennials. Annuals are plants that complete their growth cycle in one year. They are usually bright and showy, for example, marigold, and used to create flower beds. They bloom for long periods in summer and provide a huge burst of color in a garden. You will have to plant new seeds or saplings every year if your plant is not self-seeding. Perennials have a longer growth cycle and do not produce flowers in the first year. Though perennials are costlier than annuals, the former may turn out to be a better option for homeowners in the long run because they do not have to be replaced every year. Average softscaping costs range around $11 per sq.ft. Xeriscaping 4 is a type of landscaping designed specifically for drought-afflicted areas or areas where water conservation is of prime importance. However, contrary to popular perception, xeriscaping 4 does not make your grounds look like a desert. Common xeriscaping 4 practices involve deploying plants that are native to the area and clubbing together plants that have similar water requirements in order to conserve more water. Professional xeriscaping for a 1,200 sq. ft. yard can cost around $12,000. If you have your mind set on on natural grass for your lawn, you have two options: sod and seed. Establishing a lawn from seed involves planting and growing your own grass. You can either choose to do it yourself or hire a landscaper. If you choose the sod option, a sod growing professional has already done the growing for you. Sod comes in rug-like rolls that consist of mature grass and a layer of soil and can be laid out by a professional. Install seeds $0.05 per sq.ft. Install sod $0.40-$0.70 per sq.ft. Install fencing $10-$30 per linear ft. 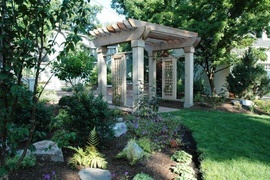 Build a pergola $3,100 cedar structure 100 sq.ft. Lawn seeding is the process of using seeds to add new grass to a lawn. The total cost will depend on the size of the lawn, the type of seed, and the amount of prep work involved. You can use seeding to cover thin patches in an existing lawn or to start a new lawn from scratch. Fescue 8 seeds cost $65 for a 5,000 sq.ft. lawn while Bermuda, Kentucky Bluegrass and Bahia seeds cost $100, $98.50 and $105 respectively for the same square feet area. Most homeowners prefer to have soil, rock or mulch 6 delivered at home because they may not own a truck large enough to carry that load. Some contractors charge a fixed fee for delivering the materials while others may charge a percentage of the weight of the materials being delivered. Your location and accessibility are other factors that affect the cost. An outdoor fire pit can be constructed using brick ($150-$280), stone ($180-$320) or steel ($100-$150). If you are building a brick fire pit, you will need two types of bricks: firebricks 9 ($1.20 per piece) for the inner circle and regular bricks ($3-$4) for the outer circle. Curbing or edging gives your landscape a finished appearance. Popular materials for curbing include concrete and brick. Again, concrete edging can be done in two ways: preformed concrete blocks ($5-$10 per linear ft.) and poured concrete ($5-$13 per linear ft.). Though poured concrete, with its continuous seam, is more attractive and easier to maintain, it is costlier than preformed concrete. 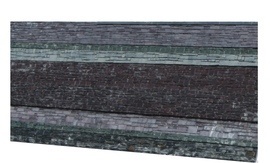 At $13-$18 per linear ft, brick edging is more expensive than concrete edging. Installation costs for a water fountain depend on the size of the fountain, materials used, the type of fountain, power supply, prep work and labor. Common materials used to construct a fountain are fiberglass 10 and resin ($160-$500), rock ($200-$700), slate 11 ($370-$550), copper ($550 onwards), stone ($370-$2,000), glass ($4,000-$1,800), concrete ($200-$1,000), and marble ($1,500-$10,000). Gazebos serve as an attractive and useful outdoor living space. They are usually constructed of wood ($1,500-$2,500) or vinyl 12 ($2,100-$3,600). Vinyl 12 gazebos are more durable and require comparatively less upkeep. Landscaping costs for a new construction site can vary between $5 and $35 per sq.ft. depending on the design style, materials and location. An outdoor misting system will keep you cool even in the sweltering summer months. 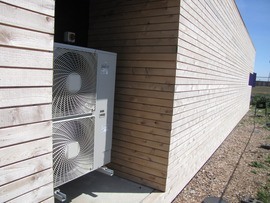 A good quality misting system can cost between $1,800-$4,500, including pump 13 and labor. 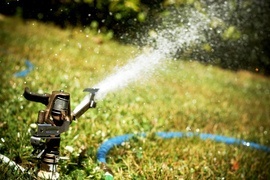 A sprinkler system 7 lessens the pain of caring for your lawn and also helps you conserve water. To install a sprinkler system 7 in an 8,000 sq. ft. lawn ($2,500-$3,500), you will need 10-15 pop-up sprinkler heads 14 ($2-$4 per piece), standard PVC pipes ($400-$600), and a trenching machine ($150-$170 per day). Lawn repair after digging the trenches ($500-$1,000) and labor ($1,080-$2,400) will add to the total cost. A pergola provides a bit of coverage or shade from the sun, but it also allows all of the airflow to reach those comfortably seated beneath it. It is an ideal structure to support vining plants and flowers, and can serve as a wonderful outdoor room. A pergola 3 roughly 100 sq. ft. in size and made of cedar will cost around $3,100. At $5-$20 per sq.ft., artificial grass installation costs significantly higher than installing sod or seeding. However, artificial grass lasts for a very long time and requires very less maintenance. On an average, sod installation costs $0.65-$1.30 per sq. ft., including sod plugs and labor. Common types of sod used are St. Augustine ($0.30-$0.80 per sq. ft.), Bermuda ($0.40-$0.85 per sq. ft.), Zoysia ($0.40-$0.60 per sq. ft.) and Fescue 8 ($0.25-$0.70 per sq. ft.). A pond can be a beautiful addition to any backyard. Installation costs for a pond depend on a number of factors such as pond size, liner 15, shape, type of filter, pump 13, and labor. 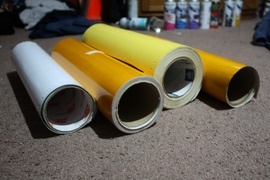 A prefabricated plastic liner 15 is easy to clean and install and costs around $0.80-$1.20 per gallon. Rubber liners 15 are flexible and customizable and cost $0.16-$0.20 per gallon. Concrete liners 15 are sturdy and durable and cost $0.33-$0.43 per gallon. 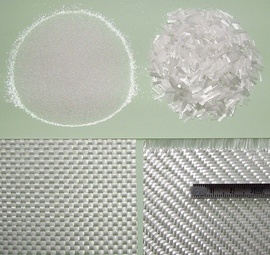 Fiberglass 10 liners 15 are the most expensive and cost around $3.53-$5.88 per gallon. You can use internal pond filters ($150), external pond filters ($80-$130) or skimmers ($150-$250). Pathway installation costs typically depend on size, design, prep work and material. Concrete pathways will cost $5-$16 per sq. ft, while brick, pavers and natural stone will cost $8-$12 per sq. ft., $10-$25 per sq. ft. and $18-$30 per sq. ft. respectively. Residential landscaping can be essential divided into three phases: design, ground preparation and installation. During the design phase, the landscape designer and the homeowner will work together to determine the budget, the purpose of the land, the family’s needs and wants (for example, kitchen garden, play area for kids, outdoor dining), and preferred landscaping style. The designer will then come up with a detailed plan that includes specifications such as sizing and what plants and materials to use. Ground preparation and installation are usually completed by a landscaping contractor who will charge $45-$75 per hour for labor. Some projects may have multiple contractors working on them. Many landscaping companies also provide related services such as tree removal ($200-$1,500), tree trimming ($75-$500), lawn fertilization ($20-$250), and yard cleanup ($100-$1,000). Tree removal is essential when there are fallen trees, dead trees or trees leaning in a dangerous direction on the property. The overall cost will depend on the height of the tree and whether you want the professionals to remove all the pieces and stump as well. In some cases, it may not be necessary to cut down the entire tree. Instead a simple trim and removal of the long limbs can help get rid of the danger posed by the tree. Lawn fertilization provides grass with the essential nutrients to promote leaf and root growth and also helps to reduce weeds. Yard cleanup may be done in fall, soon after summer or just before spring to remove dead foliage and clear all debris and clutter. The total cost will depend on the size of the yard, the number of trees on the property, and whether you wish to have the debris removed or piled curbside. Regular landscaping maintenance ($75-$100 for an 8,000 sq. ft. lawn or $45-$75 per hour) is essential to prevent pests and diseases from wreaking havoc on your plants and to make sure your lawn’s appearance is not marred by brown patches or weeds. Landscaping maintenance services usually include mowing, clipping, pruning, leaf removal, and mulching. You can hire a landscaping professional to take care of your landscaping maintenance needs and save both time and effort. 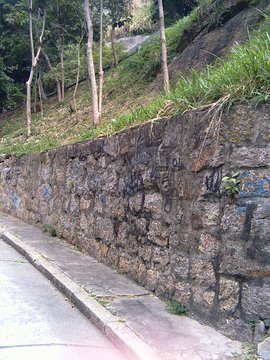 A retaining wall 5 can serve decorative purposes as well as provide reinforcement and prevent soil erosion. A concrete retaining wall 5 50 feet in length and 8 feet high will cost around $13,700. Outdoor lighting can enhance the look of your property and add to the safety. On an average, you can expect to pay around $3,800 for installing 20 light fixtures. An outdoor kitchen ($2,700-$10,000 depending on size and appliances) can provide a great entertaining space for friends and family. If you have a big backyard, you can consider putting in a swimming pool. 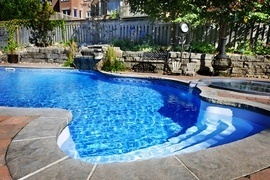 A basic 32’x16’ in-ground swimming pool costs around $22,000. If you are doing your landscaping on a limited budget, you can choose to phase out your landscaping over a couple of years and do only those projects that provide the maximum value. 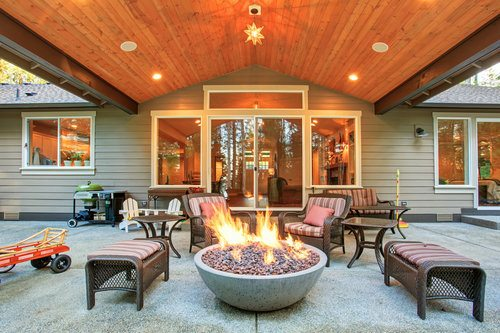 If you are having a natural gas fire pit installed, you may need to hire a plumber for connecting the fire pit to the gas line ($200-$500). When done right, landscaping can increase the value of your home tremendously. Generally, people spend about 10% of their home's value on landscaping. You can conserve water by installing synthetic grass or turf that looks real and doesn’t require frequent mowing or watering. You can also set up your own water conservation system by collecting the water from downspouts in rain barrels and use that to water your garden. Always choose plants that can withstand the regional temperature and weather conditions. The U.S. Department of Agriculture Plant Hardiness Zone Map is a useful resource. Don’t bite off more than you can chew. Some landscaping projects (or plants) require a great deal of maintenance and care. If you are new to landscaping or are not at home most of the time, choose plants that are low maintenance and resistance to drought, disease etc. If you have a pet at home, you may want to consider designing a pet-friendly yard or dogscaping as it is otherwise known. This will provide a permanent solution to torn flower beds, crushed plants and pee stains in the lawn. Large landscaping projects may require the city’s approval. Most cities follow landscape regulations to promote a sense of community and encourage water and energy conservation. Cut down costs by getting creative. If you would like to repurpose old things, try using a rusty railing as a trellis or an old wheelbarrow or a tire as a planter. Some people focus on landscaping for the front yard in order to improve curb appeal and neglect the backyard. But if you are planning to sell, note that potential buyers may be put off at the sight of a wild and unkempt backyard. How do I landscape my yard? For best landscaping results, hire a professional landscaping designer. If you are going the DIY route, it is better to start small. Establish a budget, list your needs and wants and then study the yard carefully to understand how wind, water and sun can affect your landscape before making any changes. Complete your hardscaping projects before you plant shrubs or trees. What is involved in landscaping? Landscaping involves planning, ground preparation, installation, and maintenance. During the initial phase, the homeowner will work with a landscape designer to come up with a detailed plan that addresses the budget, scope, and dimensions of the project. During the prep phase, the ground will be prepared for installation and existing landscaping will be removed or amended. During installation, hardscaping projects, if any, will be completed first before moving on to softscaping. Your maintenance needs may vary from regular weed removal to washing or painting wooden structures, depending on the type of landscaping you install. What is a landscape construction? Landscape construction may involve many different projects like putting in a new patio or a pergola 3, setting up a water fountain, installing fencing, planting trees, or redoing the lawn. A detailed landscape design can cost between $2,000 and $8,000, depending on the size and location of the project. On an average, a landscaper charges between $45 and $75 per hour. How much does landscaping cost per square foot? If you go by the square footage of the property, you can expect to pay between $5 and $35 per sq.ft. 3 Arbors: (Also known as Pergola) An arched structure with an open roof and cross rafters, supported by posts or columns, typically installed in a garden, park, or backyard and usually covered with climbing plants or vines. 15 Liner: A covering, usually made of vinyl, for the walls and floor of a swimming pool, used to keep the water in and protect the pool's surface. How much does it cost to landscape on a new construction in my city? Cost to landscape on a new construction varies greatly by region (and even by zip code). To get free estimates from local contractors, please indicate yours. We have added an image of a fire pit in the common landscaping installation projects section to show the user how a fire pit looks like. The cost guide has been remade adding more information and updating the costs. The sections "Cost factors", "Backyard vs. front yard landscaping", "Landscaping design", "Types of landscaping", "Sod vs. seeding", "Common landscaping installation projects", "Landscaping process and labor", "Related services", and "Maintenance" have been added and now there is more detailed information about the different options and possibilities with their costs. For example, you can find information about different landscaping styles: Mediterranean, Japanese, Tuscan, etc. You can also find new tables with the types of landscaping and most popular landscaping projects and their cost. Moreover, new options have been added as enhancements like an outdoor kitchen, that may not be included in the average project, but may interest you. The "Additional considerations" section now offers information about home value, landscaping on a budget, water conservation, DIY projects and dogscaping. A "FAQ" section has been added, where you can find any other piece of information that may not be found in other sections. 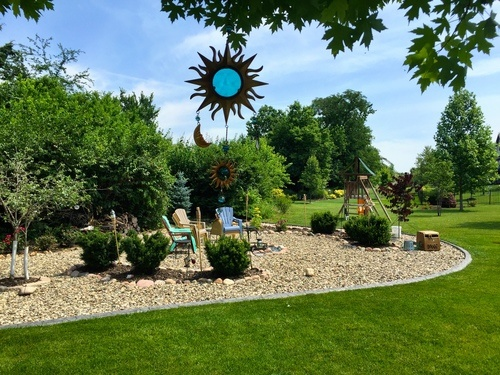 Cost Considerations: Xeriscaped yards use up to two thirds less water than yards with lawns. 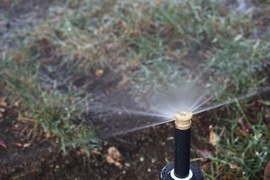 Over time, this cost savings can cover the cost of installation, especially in areas where lawns require regular watering due to rainfall not being sufficient to keep them watered. The cost of xeriscaping can range from $10,800 to $27,500. 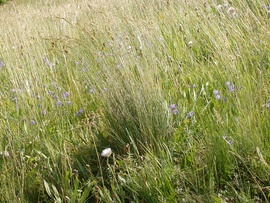 A coarse, resilient grass that stays green all year. Fescue is considered a cool-season grass, so it does well in cooler temperatures but can turn brown quickly in the heat. This means that it must be watered frequently in the summer. Cost Considerations: Firebricks cost about $3 to $7 per brick. Cost Considerations: A standard pop-up sprinkler head averages $2 to $4; most lawns use 10-15 sprinkler heads.